From a small seed, a mighty trunk may grow. These Carolina springs are getting wonkier and wonkier. I went out on Tuesday in the sleet storm and tried to pick turnips in the tunnels and gave up a few bunches in due to how miserably cold and wet it was. My fingers were numb and my nose was running. Then, come about 3 o’clock, the sky cleared up and the sun peaked out, and the temperature spiked by 25 degrees! It’s hard growing in the spring, too, because of how all-over-the-place the weather can be, and it’s only getting harder, what with climate change and all! It’s crazy to think how disconnected we are as a whole from this planet, thinking as if the health of this planet didn’t directly relate to our ability to keep living. Probably because we now think that if we have enough money, we’ll be able to keep living. All the money in the world can’t buy food that won’t grow from a scorched earth, though. I imagine a hundred years ago, maybe less, people would find our ignorance and disregard for the health of this planet disturbing, if not outright laughable. I have a tendency to be pretty cynical about it, though, so I’m going to move on! Things are moving along at the farm, slowly but surely. I’m really making an effort to adjust my mindset about this whole endeavor, to come at it with much less urgency and stress and instead with much more care and patience, a mindset that places value on quality rather than quantity. Alisha of the Bulb has been coming out to help on the farm, and last week I provided a whole slew of produce and eggs for her mobile markets to serve those living in food-insecure neighborhoods in the Charlotte area. I’m excited to see where this new relationship takes me and us. We were able to get a ton of stuff harvested this week, get some more baby greens seeded, and get the eggplant and peppers potted up into 4-inch pots to grow out a bit more before we get them in the ground before too long! It’s looking to be pretty rainy this coming week, but hopefully not too much, as I’ve got to get some compost moved and spread on some more beds and get those fertilized so I can keep on planting down the line! We’ve got about fourteen 100′ beds planted so far, not including the beds in the caterpillar tunnels, so we’ll just keep on marching! I hope to see you all out at the Piedmont Farmer’s Market on Winecoff School Rd. tomorrow from 8am til noon! We’ll be there with lettuce mix, spinach, baby kale, salad turnips, microgreens and eggs! Coming soon will be more radishes and arugula, and then the hits will keep on coming! I hope you all have a wonderful weekend, and a terrific week! Much love! Do you ever feel like no matter how hard you’re working, it feels like you’re taking one step forward, then two steps back? Man, I’ve felt that way the past couple weeks. It seemed as though with every victory, with every completed project, some problem would arise that would throw everything off and necessitate my utmost attention, stripping that attention from everything else that I had planned to accomplish. Well, I suppose it’s just a lesson that, while it’s good to have a plan to fall back onto, things rarely go according to plan, and you can either let the setbacks overwhelm you and bring you down, or you can force a grin and bear it, figure it out, and see it through, which will go much further to forge your character. Many people would consider me a character, but that’s a whole other story. Setbacks aside, we finally have plants in the ground at Street Far Farm! Yesterday I completely filled one caterpillar tunnel with baby kale, arugula and radishes. It was exhausting, but I’m happy to see some green things growing, and certainly ready to bring them to market. 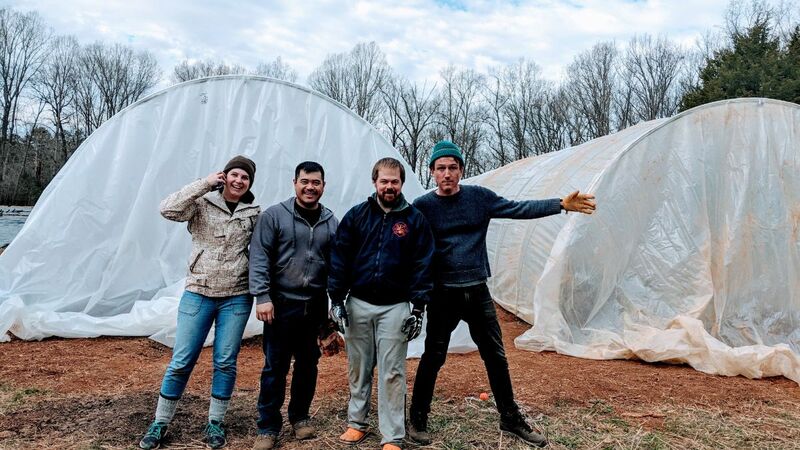 The second tunnel will be planted out with spinach, lettuce and radishes any day now, there are just a few more pressing issues at hand considering the miserable outlook in the 10-day forecast. Does anybody else feel waterlogged? I’m praying for a dry spell at the end of this month and beginning of March, I implore you to pray the same. I’m planning to get the first field plantings in the ground mid-March, but there’s still a good bit to do to get the beds ready, and some dry weather would be extremely helpful. Stay tuned for an announcement on a fun-filled day of spreading compost, an event you too can come enjoy! In personal news, I’ve decided to go on an indefinite social media fast. I won’t go too far into it, but I will say that I think our American society has become increasingly devoid of a sense of tangible, face-to-face communal interaction, and at the same time increasingly preoccupied with the comparison-culture that is inherent in the social media domain. I personally believe that a return to live-and-in-person community development would go a long way to reverse the growing extremist polarity that we see growing in our culture. I also think that social media creates for the individual user a myopic and biased perspective on our world as the algorithms that determine the viewers content are engineered to show you more of what you’re already looking at, whereas true, communal human interaction will give you a perspective on the world that hasn’t been designed to reinforce what you have already been thinking, thereby creating within you a more rounded and grounded perspective. I could go on, and if you’ve read my newsletters in the past you know that I can have a tendency to rant, but I’ll leave it by saying that I’m getting off social media because I want to stop comparing myself to others, I want to break the dopamine-feedback-loop of garnering “likes” and “shares”, I want to be more productive and present, and I want strengthen my own skills of human interaction and make deeper and more meaningful connections with the people I care about. If you’d like to talk more about it, come see me at the market or drop me a line! Come on out and see us at the Piedmont Farmer’s Market on Winecoff School Rd. tomorrow from 9am til noon and get your microgreens and eggs! I’m hoping we’re just a few weeks away from some real veggies, so stay tuned! A special shoutout to my new friend and CSA member Steven who has been volunteering a lot of his time out here at the farm, primarily cutting limbs hanging over the road up to the field. 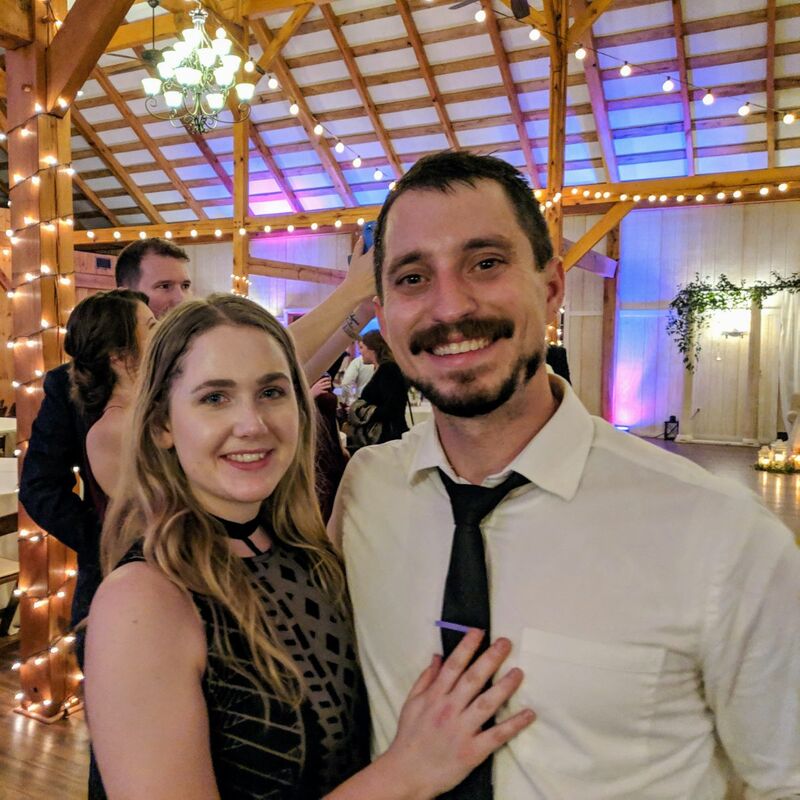 I often feel as though I’m entirely undeserving of the opportunities and help that I’ve been given throughout this journey, and I am extremely grateful for Steven and the rest of you that support my efforts. Running a business sometimes feels as an extremely selfish venture, but I try to approach it from the perspective that I’m doing this out of service to my community by providing the healthiest food I can muster from the Earth, and that I’m doing this out of service to the Earth itself, helping to build diversity which lends to a healthier ecosystem. Thanks, Steven, you’re really putting the “Community” in “Community Supported Agriculture”! Have a wonderful weekend folks, and maybe the next time you’re on the Facebook, if you see a post from a friend that you’d like to comment on, maybe pick up the phone and give them a call before you post that comment? Just a thought! Be well! The best time to plant a tree was twenty years ago. The second best time in now. Man, that’s a pretty picture. That tree sits right by the river on the property I’m living on, and I love that tree. It’s an old tree, half-dead, but the craziest part about it is the huge, dead grape vine wrapped around it. Usually a vine like that will kill the tree, but in this instance, the tree won the battle and the vine is but a skeleton, still gripping the tree even in death. I can’t take credit, that picture was taken by a guy named Remy Thurston, who is a great photographer. It’s making me anxious for spring. I just finished a book last week titled The Man Who Planted Trees by Jim Robbins, which was a great read. 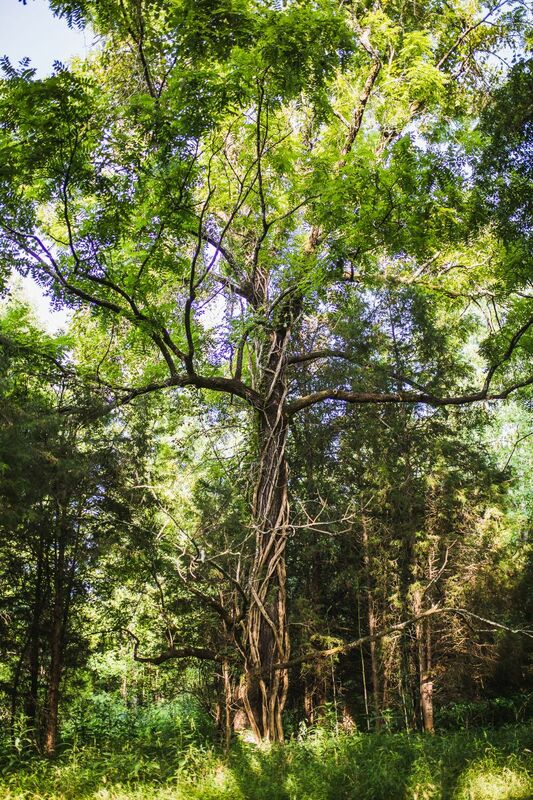 In summary, it describes the efforts of a gentleman, David Milarch, who, after surviving a near-death-experience, claims to have been commissioned by spiritual beings to seek out and clone the “Champion Trees” of this planet, the biggest, most robust trees of every species, in an effort to preserve their genetics in a world where deforestation is rampant, either directly by the hands or man or indirectly due to environmental changes caused by the warming climate. There is an argument that deforestation is far and away a greater contributor to the shifting climate than our consumption of fossil fuels, for not only do trees sequester a huge amount of carbon, they also cool the earth by their shade and their respiration, as well as act as buffers against solar radiation, and the massive clearing and die-outs of our forested lands are having an exponential effect in the warming of our planet. The author also describes some of the more obscure research being done on trees, which is a severely under-researched field of study, theorizing the other benefits trees have to not only our environments, but to us, such as emitting aerosols that help regulate our hormones and keep other plants and animals healthy, filtering ground and surface water much more effectively and efficiently than our modern water-treatment facilities, and even that trees hold clues to our connection to the celestial bodies outside of our atmosphere, the stars above. Just down the road from me, a new solar field was installed. A massive one. Now, don’t get me wrong, I’m all for transitioning our energy inputs from fossil fuels to more sustainable means, but to install this solar field they had to clear-cut a lot of forest. After reading this book, I’m under the assumption that the trees were providing much more benefit to our planet than that solar field ever will. David is doing his work of securing these genetics at the Archangel Ancient Tree Archive, check them out and read the book, I highly recommend it! Be warned, it will make you want to plant some trees! Lot’s going on here at the farm… the microgreen/germination chamber in my basement is getting a much-needed facelift, and I’m making some improvements and experimenting with some bottom-watering techniques to hopefully better streamline that enterprise and make it more automated. At the same time, I’m increasing my microgreen production, so get ready for some tasty shoots! I’ve also been able to take advantage of this stretch of dry weather to get some initial tilling done where I’ll be installing my two 14’x100′ caterpillar tunnels for under-cover growing! With my first plantings going under these tunnels in just over a month, it’s high time! Aside from that, I have a hawk that is picking off my chickens, and I really need to do something about that. Pronto. I have a few ideas: hawk netting, locking the chickens in their coop for a week to break the predators routine, or, as a last resort, a rifle. Once I take care of that issue, I need to re-stock my flock ASAP, for demand is rising but eggs are dwindling! I also plan on getting some other fowl, a few geese to protect the flock, and maybe some guineas to knock down the tick population in the spring and summer. I hope to see you all at the Piedmont Farmer’s Market on Winecoff School Rd. tomorrow from 9am til noon! It’s going to be a mite chilly in the morning, so bundle up, we’ll have the heaters on! I’ll have Pea Shoots, Radish Shoots, Sunflower Shoots, and the return of the Micro Mix! Of course, I’ll have eggs, too. I wanted to share something I’ve been doing with my Pea Shoots, a delicious side-dish. Heat your pan (I use this cast iron skillet for everything) medium-high with 2-3 tbsp the oil of your choice. I like all the oils, so I usually do butter, bacon grease, and coconut oil, just to run the gamut. Chop up AT LEAST 3 cloves of garlic, cuz one clove is just not enough. When the pan is hot, take a clamshell of Pea Shoots, rip them in half, and throw them in the oil with the garlic. Sprinkle with salt, and stir until all shoots are coated with grease and the tiny leaves turn dark green and start to wilt. Boom. Delicious. I’m going to have some with my eggs right now! I wanted to extend my condolences to the family and friends of Gina Guthrie, who passed away early Tuesday morning after a long bout with cancer. Gina was a great friend to the Piedmont Farmer’s Market, The Lomax Incubator Farm, and farmers all across Cabarrus County. She was very supportive of my farming efforts from the very beginning, sourcing produce from me when she could for her farm-to-table catering company, Bocca Felice, and was a wonderful crusader working to change the way people thought about the food that they eat and where they get it from. She was also just a wonderful lady who always had a smile on her face and a sweet and caring temperament. You will be missed, Gina, but now you are in the presence of glory! Have a great week, folks. Be excellent to each other, and party on! I want some pigs, I really do. Just a couple, just to suss out that whole situation, to see what it’s like, to see what it takes, and to stock up the freezer with some delicious pork chops, sausages and bacon raised by my hands and watchful gaze. I love the idea of adding a hog enterprise to my operation, as they are relatively low maintenance, have a relatively quick turnaround as the generally mature to slaughter weight at about six months, and everyone I know that works with pigs absolutely love them. Everyone except my sister, Bree, who at one time raised a pig named Mabel. Mabel for the table, she said. I guess Mabel was kind of mean, and my sister hated Mabel. I never met Mabel personally, but I did get to enjoy a delicious Mabel ham when I went to visit Bree in Olympia when I was sixteen. That was almost half my life ago now. Wow. Her daughters were just toddlers then, and now one is twenty and the other is as old as I was on that trip. Crazy. Anyway, my better judgement tells me I shouldn’t get pigs this year, that I should put all my focus on building my vegetable enterprise, my bread and butter, here on this new land before I add anything else into the mix. My better judgement tells me I need to pump the brakes and get one enterprise sorted before letting my lofty aspirations get the better of me. My better judgement is probably right, but my better judgement may lose out on this one. How much could two pigs get in the way, anyway? I’ve been going full bore since the New Year! Well, since the day after New Years day, that is. I’ve been following through on the morning routine I’ve committed to, though I’ve been feeling a bit of the low-carb-flu since adopting this Whole30 challenge. Getting back in the swing of things doesn’t happen automatically, either, so, if you’re like me and your re-committed-to routines are taking a little longer than they used to, be gracious to yourself and tell yourself that you’ll be back in fighting form in no time, as long as you keep going through the motions. Anyway, here at the farm, projects are still getting underway! The microgreen chamber in my basement is currently undergoing massive renovations, with lots of improvements to streamline that operation. My post harvest area is so close to being complete, too. Now I just need this damned rain to quit for a bit so I can do a little field work! 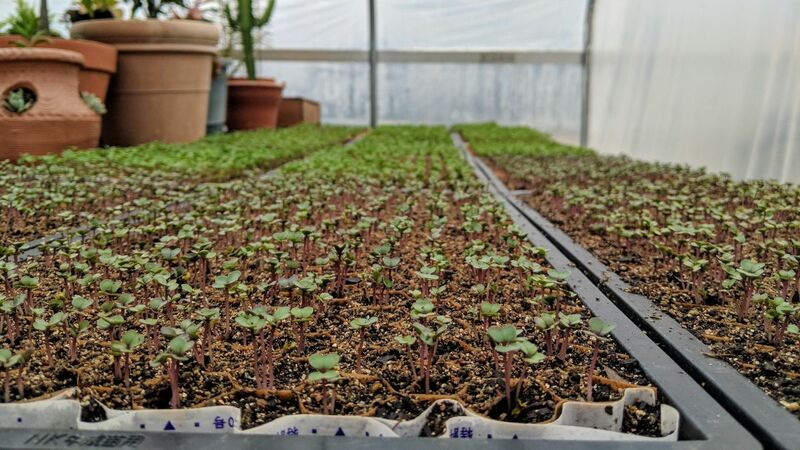 The first seedlings of the season are going to be started in just a couple weeks, and there’s lots still to do to get ready! I’m pumped, I’m feeling good, and I know that if God is for me, who can be against me? This is going to be the best season Street Fare Farm has ever seen, and I can’t wait to share it with you! Stay tuned for an announcement for a field day soon to spread some compost! I hope to see you all at the Piedmont Farmer’s Market on Winecoff School Rd. tomorrow from 9am til noon! I’ll be there with some Pea Shoots, Radish Shoots, Sunflower Shoots, Basil Shoots and, of course, the true stars, the free-roaming, woodlot-raised, non-GMO eggs, laid by Concord’s very own Street Fare Farm Cluckettes! These ladies have been working hard to get you folks their very best offerings of eggs, come out and show them your support! I know I shouldn’t curse the rain, I’m just tired of the wet and soggy and soppy and grey. Much like Superman, whom I have much else in common with, I derive my power from the glorious sunshine. Sun, o’ Sun, where art thou, where are thy gleaming rays, where did thee go? Have a great weekend, and I’ll catch you on the flip! Happy Solstice errbody! It’s an oddly warm and rainy start to the winter, but that’s ok. Actually, I’m not that ok with it. I’m so sick of the rain! The basement is starting to take in water as saturated as the ground is, and I’m in desperate need of some vitamin sunshine. It rained all last weekend that I was away celebrating the union of my oldest and closest friend Matt to his bride Elise, pictured above. 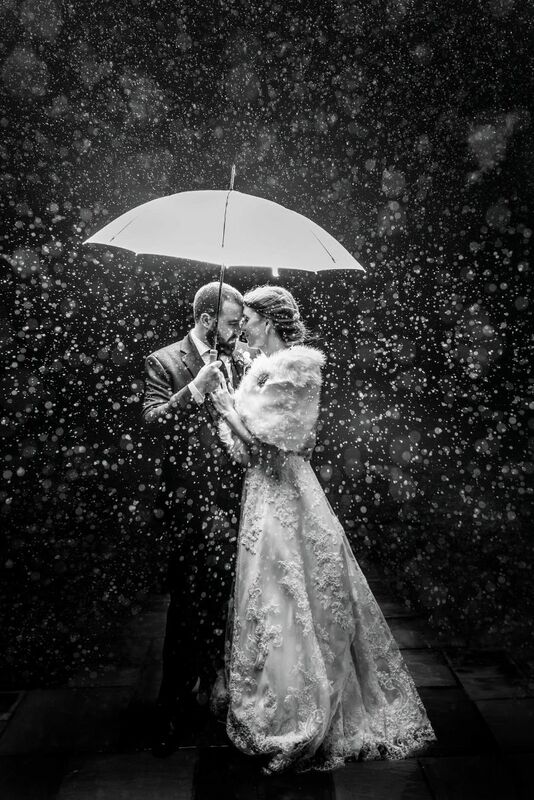 Apparently its good luck to get married on a rainy day, it starts the marriage off on a note of cleansing. It was a beautiful ceremony, and it was great to be there for my dear friend and to see many faces that I haven’t seen in a long time. I’m making it a resolution in 2019 to keep in closer touch and reach out more often to the people I care about, and while this trip was brief, it was great to see some of those people once again! Sky and I had a lovely visit with my parents and my niece Annalise and her lovely mother Tory after the wedding festivities, and we made it back safe and sound Monday evening. Congrats Matt and Elise, I pray for many years of deep love and companionship for the both of you! I want to give a very special shout-out to my Father, David, today. Today is a momentous day for my father, as today is his last day at work EVER! That’s right, after some 35-odd years as a maritime attorney, as well as other working lives prior, he’s ready to cash it all in and get down to some serious living (and driving my mom nuts)! I’m very proud of my father and his work ethic, he built a tremendous practice for himself in order to support his family, and was top of his field. I find myself becoming more and more like my father with each passing day, and while this used to frighten me immensely, I now know that if I can live on to become half the man that he is, then all his (and my mom’s) efforts in raising me will certainly not be for naught. Congratulations, Dad, I wish you the utmost of fulfillment in your post-work life, as well as some much deserved rest! Here’s his picture from the firms website, I’m looking more and more like him every day too, what with this receding hair line! 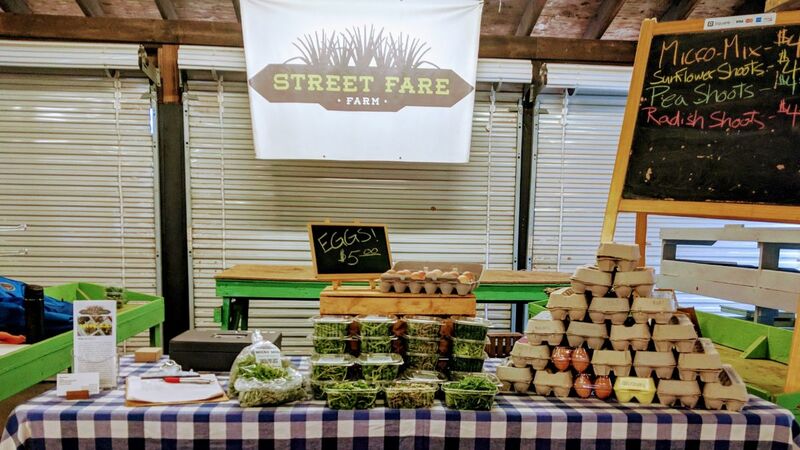 There’s still time to sign up for the 2019 Street Fare Farm CSA and receive a $20 gift certificate redeemable at my booth at the Piedmont Farmer’s Market at any time! The days of 2018 are running thin, but there’s still 10 days to become a part of the Street Fare Farm Family and redeem this limited time offer! Head over here and sign up today! I hope to see you at the market tomorrow! 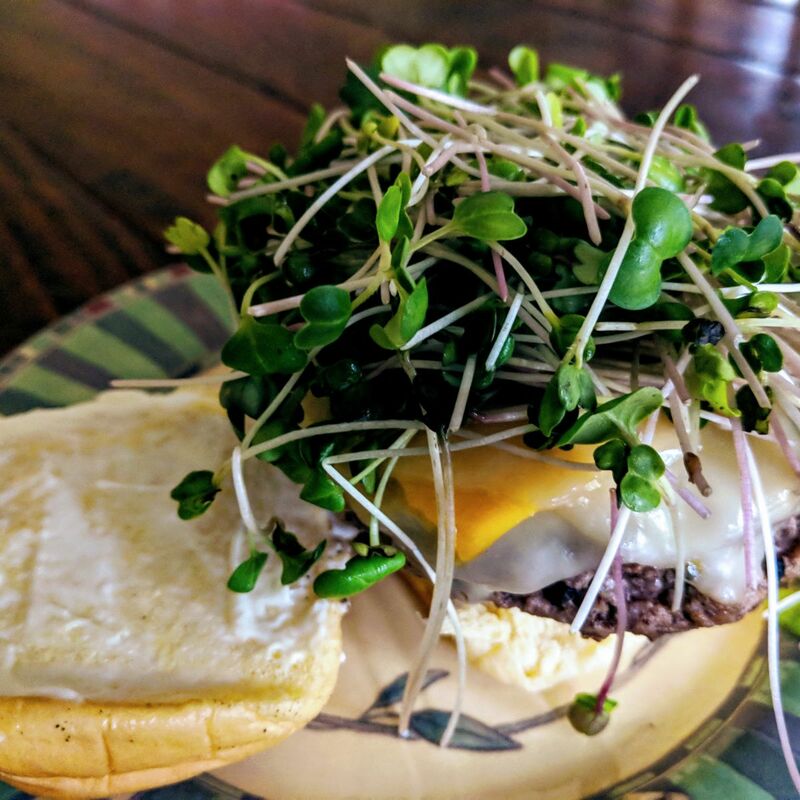 I missed you last week, but I’ll be there tomorrow with microgreens and eggs! Come get your fixings for a Christmas salad, and I know I’ve said this before, but growing up, every Christmas, without fail, it would turn out that there weren’t enough eggs to feed everyone that was home for the holiday and we’d have to scramble (no pun intended) to find someplace open to fetch some! Don’t let this happen to you! My girls and I have been working hard to make sure that there are plenty of eggs available for your Christmas breakfast, so come and get them! I hope you all have a wonderful Christmas, and I’ll check in with you next week before the new year!